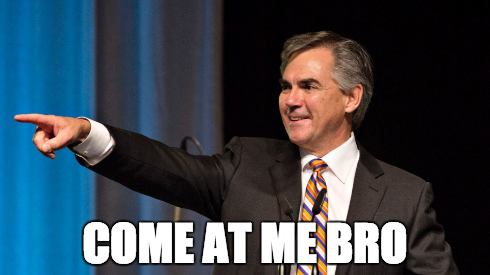 Who will stop the Jim Prentice juggernaut? The past few months have been a sobering reminder that it foolish to underestimate the staying power of Alberta’s 43-year long governing Progressive Conservatives. A year ago the scandal ridden PC Government appeared to be on the verge of collapse. And now, without needing to present a clear vision for Alberta’s future, it looks like the PC Party could once again wipe out its opposition in the next election. You read it here first, folks. 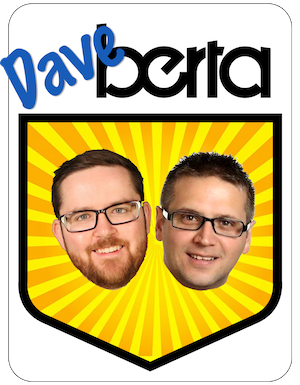 The daveberta.ca decision desk has called a PC majority win in Alberta’s 2015 election. Congratulations, Premier Jim Prentice. You win. We are not worthy. Yup. It has been another strange week in Alberta politics. Cabinet Shuffle: Rumours are circulating in political circles that Mr. Prentice could soon shuffle his cabinet with appointments for former Wildrose MLAs Danielle Smith and Kerry Towle. Returning to social media after a recent vacation in Mexico, Ms. Smith apologized to her former party’s supporters for not notifying them before she led the majority of the Wildrose caucus to cross the floor to the PCs in December 2014. Unite what’s Left: The resignation of Raj Sherman as leader of the Liberal Party has spaced another round of discussion about uniting Alberta’s tiny progressive opposition parties. Liberal MLA Laurie Blakeman said that she is willing to step in as interim leader and would like to work to unite the various opposition parties. NDP leader Rachel Notley is firmly against this venture, a concept that was overwhelmingly vetoed by her party’s activists at numerous conventions. More Right: The Alberta Party appears a little less progressive this week as leader Greg Clark announced that former Wildrose candidate Tim Grover is now the party’s Executive Director. Mr. Grover ran for the Wildrose in the September 2014 Edmonton-Whitemud by-election and placed third behind NDP candidate Bob Turner. “I will be investigating what might be involved in creating cross partisan alliances, cooperation etc.,” wrote Mr. Dawe. More Boots: Former PC and Wildrose MLA Guy Boutilier resigned from Wood Buffalo Municipal Council this week and rejoined the PC Party, sparking rumours that he might challenge MLA Mike Allen for the nomination in Fort McMurray-Wood Buffalo. MyMcMurray reports Mr. Boutilier’s resignation from council was part of a court settlement related to his residency in Fort McMurray. Resignations and Re-Elections: Retirement and re-election announcements continue: Dunvegan-Central Peace-Notley PC MLA Hector Goudreau announced his plans to retire. Former NDP leader Brian Mason will seek re-election as MLA for Edmonton-Highlands-Norwood. Edmonton-Mill Creek PC MLA Gene Zwozdesky, Calgary-North West MLA Sandra Jansen, Calgary-Hawkwood PC MLA Jason Luan and Edmonton-South West PC MLA Matt Jeneroux announced they will seek re-election. The PCs picked up a big name candidate today as businessman and Edmonton-enthusiast Chris Labossiere announced he is running for that party’s nomination in Edmonton-Rutherford. The list of nomination candidates has also been updated. This entry was posted in Alberta Politics and tagged 2015 Alberta Election, Brian Mason, Calgary-Hawkwood, Chris Labossiere, Danielle Smith, Dunvegan-Central Peace-Notley, Edmonton-Highlands-Norwood, Edmonton-Mill Creek, Edmonton-Rutherford, Edmonton-South West, Edmonton-Whitemud, Fort McMurray-Wood Buffalo, Gene Zwozdesky, Greg Clark, Guy Boutilier, Hector Goudreau, Jason Luan, Jim Prentice, Kerry Towle, Laurie Blakeman, Matt Jeneroux, Michael Dawe, Rachel Notley, Raj Sherman, Red Deer-North, Sandra Jansen, Tim Grover on January 28, 2015 by Dave Cournoyer. I thought that Chris Labossiere was a major player in the Alberta Party. In all the news coverage about the coup in attracting Tim Grover to the Alberta Party, I did not hear any mention about Chris switching to the Prentice P.C’s. When did he switch ? Are there other prominent Alberta Party members, Liberals, Greens and/or New Democrats who have jumped on the Prentice bandwagon ? It’s time to unite behind the NDP. The NDP is the only party in the legislature with a base of support (second in many polls), candidates in place, some money and fundraising capacity, a smart & savvy leader, and a sense of where they are going. The progressive parties are not about to unite, so let’s unite them ourselves through the one vehicle that’s at least pointed in the right direction. Call it strategic voting, voting with our feet, invading the NDP, whatever. It’s time to unite the left ourselves and stop waiting for the parties to do it themselves. Look at Labossiere’s blog where he compares cabinet ministers to Michael Jackson going after kids. He has no business running for any party. I think we –the people—will stop the Prentice juggernaut. Each of us constitute one vote. Each of us belong to a family. Vote anything but Tory. Get your families to vote anything but Tory. Family by family is how we do the matter of turning away from the Progressive Conservative Party of Alberta and the Progressive Conservative Party of Canada. It may take a while for the kids to grow up to become voters but if we start with ourselves and our families, change will happen in Alberta. Albertans tend to vote for one party for ages and then dump the entire party and start over again. Sooner or later this pattern will repeat. Jim “Thunderbird” Prentice and his lackeys are rushing to the polls in a desperate attempt to hoodwink Albertans one more time. Anybody that votes for the PC’s needs to have a copy of the budget report in their hip pocket on election day…..how can you even consider supporting a party with the history they have created in the recent years? I guess that if you are a CEO for a large corporation, you have nothing to worry about, however, those of us that are NOT living the life of a high roller are the people that Prentice blames for the state of the PC Party. As a senior, I am not prepared to support him nor his throng of clowns! Let’s do our homework; vote for the party that has the middle-low income voters at heart.